RATH6: Athame Simple Wood Handle (6" w/brass trim) $7.00 Elegantly simple athame with a double edged stainless steel blade, natural wood hilt, brass trim, & leather sheath. (You can carve the wood with symbols, stain or paint it to suit your particular tradition.) 6" total length. 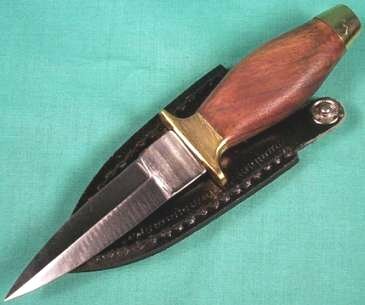 RATH7: Athame Simple Wood Handle (7" w/brass trim) $10.00 Elegantly simple athame with a double edged stainless steel blade, natural wood hilt, brass trim, & leather sheath. (You can carve the wood with symbols, stain or paint it to suit your particular tradition.) 7" total length. RATH9: Athame Simple Wood Handle (9" w/brass trim) $15.00 Elegantly simple athame with a double edged stainless steel blade, natural wood hilt, brass trim, & leather sheath. (You can carve the wood with symbols, stain or paint it to suit your particular tradition.) 9" total length. RA822: Athame: 6 1/2" mini $13.00 Slim, double-edged athame with multicolored wood handle. Perfect for the space-challenged altar! RATHC: Athame Color Wood Handle (8 1/2") $20.00 Elegant athame with layered & stained wood hilt in alternating colors. Stainless steel double edged blade is completely imbedded & riveted within entire length of handle. Has a black leather sheath with belt clip. Measures 8½" total length. RA104: Athame: Spider mini $7.00 Just 5 3/4" long, this cute, black-bladed athame has a spider on its black handle and its sheath. RATHT: Athame Tarantula (9", gray stainless steel blade) $13.00 This unique athame contains a molded tarantula motif on the hard plastic hilt with a gray, stainless steel double edged blade. Black leather sheath has embossed spider. Blade geometry will vary. 9" total length. RATHB: Athame Boot Silver Coated (6 1/2") $12.00 Athame/boot knife in silvertone metal with engraved hilt & sheath. High quality stainless steel double edged blade. Sheath has metal belt attachment. 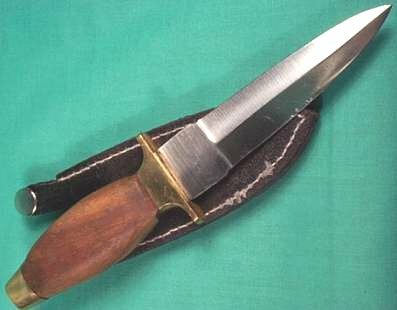 Measures 6½" long with sheath. 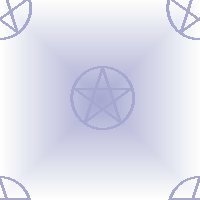 RSWOP: Sword Pentagram Letter Opener (5" long) $15.00 Pewter pentacle hilt with metal blade. 5" long.